The evolution of digital magazine publishing since the invention of the iPad has been fascinating to watch. Some publishers rushed in right out of the gate, without any clear notion of what to do. These folks were roundly criticized by media pundits – and sure enough, while these early apps were a tremendous hit in the first few months, enthusiasm quickly waned. Yet we now know that the iPad and digital magazine publishing will be the salvation of magazines, as consumer demand for digital content continues to make print less and less viable. The only question remains is, how best to offer our content digitally? Here at Mequoda, we’ve long preached that digital magazine publishing shouldn’t be all about shoveling all your content to the Internet and hoping to make money from ad impressions. Our version of life involves a portal, where you can blog and offer some limited free content with the aim of converting visitors to your magazine; a digital magazine; and a store where you sell your visitors and subscribers other products such as DVDs and books. We don’t believe in giving away your content, but at the same time, we don’t believe that you should make everything paid content, because without free content you can’t convince people to buy your premium content. Indeed, one of the biggest complaints consumers have about the fun new content apps that are being offered is that there’s no there there. Downloading something that looks awesome, then finding that it’s simply a retail sales outlet for a magazine, isn’t very satisfying. 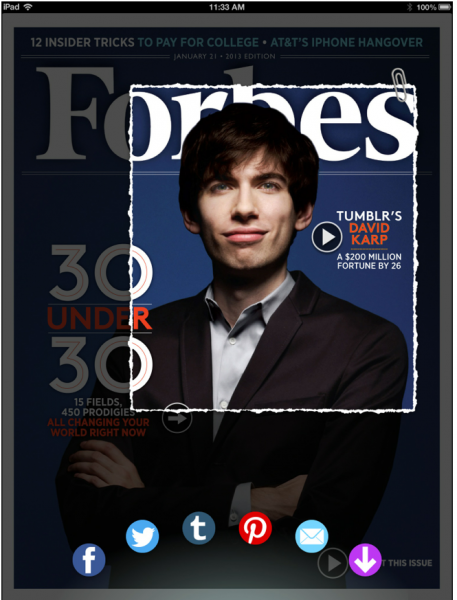 Instead, Forbes decided to wait, and in the meantime, to spend its time productively reinforcing its website – which boasted 44.2 million unique visitors in February 2013 – rebuilding its smartphone platform, and reinvigorating the print product. What has Forbes wrought? Something that we at Mequoda think of as a “multiplatform app,” including a rich, user-rewarding environment of text, images and videos, plus unique social sharing features and even the ability to click-to-purchase from within ads. Partnering with a platform startup called MAZ, and building its own set of tools that allows editors to self-publish 400-500 pieces of content every day, Forbes has created an experience that allows readers to move seamlessly from the app to the online magazine’s masses of free content and back again, read a free issue, and instantly share content socially. In reading my free issue, I found links to detailed profiles, photo galleries, opinion, behind-the-scenes pieces about the content and more, all layered on top of the magazine PDFs. According to LaFrance, the current issue contains some 1,600 links to additional content on the website. In short, the digital magazine functions as a navigation tool to help readers access the incredibly rich content on the website. The app becomes both portal and digital magazine, and rewards the user who downloads it with an unbeatable experience that’s simply irresistible. I don’t even normally read financial publications, and I was ready to subscribe after just a few minutes. A particularly fun feature within the app is the clipping tool. I admit I could play with this one for hours. You simply use two fingers to tap on an image or article, and you get a frame that you can move to fit around anything you want to keep or share. Besides the fact that it’s fun and useful, in taking sharing of content to another level, Forbes has increased the likelihood of readers helping their content to go viral, and to promote new subscriptions. Readers as marketers: It’s a theme we’re starting to hear about in digital magazine publishing circles, and Forbes has actually put it into action. 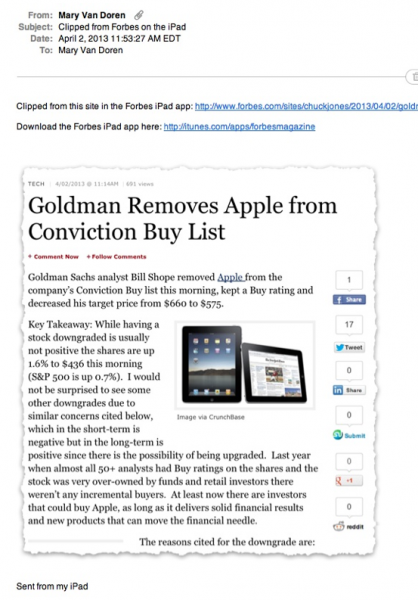 When I sent a clipping to myself, I got a lovely visual that actually looks “torn” from a page, plus a link to see the entire article, and a link to download the Forbes app. And when I clicked over to the article, there’s even a “Try Forbes for free” link – the free content in exchange for data that’s at the heart of the Mequoda method. We always urge our clients and Intensive participants, all of them small niche publishers, to take it slow when it comes to apps, at least gadget apps. When you’re good at content, but you have limited bandwidth in terms of money, time and staffing, why try to become a software company? Gadget or game apps that do something other than promote your magazine won’t make you a dime. But as long as you already have a robust portal and lots of visitors to it, and you’re making a substantial portion of your revenues from digital magazine publishing, you should be considering how to build a content-driven app to access your content and sell more subscriptions to your digital magazine. These bells and whistles at Forbes might seem daunting to you. But startups like MAZ, which Forbes uses, are popping up every day. Which means that costs are dropping rapidly, and your content- and feature-rich app could just be months away. Mequoda believes that the iPad and magazine apps are the most significant change in publishing since Gutenberg invented the printing press, and we’re excited to start following this path with our clients. If you have any experiences with building digital magazine publishing apps, or any favorite magazine apps that you’d like to share, please let us know in the comments. And now, if you don’t mind, I’m going back to playing at Forbes. Tagged with ad, ad impressions, blog, content, digital content, digital magazine, digital magazine apps, digital magazine publishing, Digital Magazine Publishing, magazine, magazine publishing, magazines, media, mequoda, mequoda method, multiplatform, niche publishers, online magazine, paid content, portal, premium content, Press+, publishers, subscriptions, text ad.